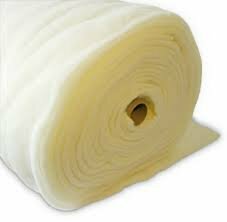 Heirloom Premium 100% Natural Cotton with Scrim is designed for quilters seeking extra strength in cotton batting. Soft and gentle, Natural Cotton with Scrim batting is perfect for quilts when low loft is desired. It becomes softer after each washing. This easy to handle batting is made with high grade natural cotton combined with a very thin scrim (stabilizer) needle punched into the batting fibers. This scrim provides superior strength over cotton alone, and prevents the batting from stretching and distorting. The fiber used to create this batting is a very clean, unbleached long staple virgin cotton and proudly displays the Cotton Incorporated seal.